The Powder River Basin is having a moment, and not just because of Permian hangups. There’s oil in them thar hills. The Permian basin is the lodestar of the U.S. oil business. But its very success has left an increasing quantity of barrels all fracked up with nowhere to go, punishing companies riding the Permian wave (just ask Halliburton Co.). On the other hand, the backlog does let other regions step out of the Permian’s shadow. One is the Powder River Basin, or PRB, in eastern Wyoming. While it produces less than 200,000 barrels of oil equivalent per day, the basin made an unexpected splash on several E&P earnings calls last month. Most notably, shale darling EOG Resources Inc. showcased what had been a relative backwater in its portfolio. The company now boasts of potential resources there of more than 2 billion barrels of oil equivalent, more than 10 times the amount it had penciled in the previous quarter. The basin’s share of EOG’s inventory of premium prospects jumped from less than 2 percent to 17 percent. In short, the PRB is generating something of a buzz. All basins do at some point; the Bakken, Eagle Ford and others all had their moment in the sun before most of the attention, manpower and investment moved elsewhere (by which I mean west Texas). Indeed, the PRB had an earlier brush with fame during the coal-bed methane boom more than a decade ago. So buzzes are to be treated cautiously, especially when they arrive coincidentally with the onset of troubles elsewhere (by which I mean west Texas). Still, a company of EOG’s caliber can’t be dismissed. And others, including Anadarko Petroleum Corp., Devon Energy Corp. and Chesapeake Energy Corp., have also recently done deals or announced big plans in the basin. The number of rigs operating in Wyoming has risen fourfold since bottoming out at just seven in the summer of 2016. One thing the PRB has going for it is its low profile. The basin hosts relatively few companies, with EOG, Devon, Anadarko, Chesapeake and privately-held Anschutz Exploration Corp. holding most of the acreage. While an acre of land in the Permian can fetch close to $100,000, they have tended to change hands for less than $10,000 in the PRB. The relative lack of development does mean less data from which to draw firm conclusions. But shale development is mostly a learning process, and there are tantalizing signs the PRB could reward diligence. Note: Number of companies refers to those included in Baird's analysis. Median wells drilled refers to the past 12 months. Note: Revenue from initial three months of production on wells drilled in the past 12 months. Basins ranked by company median. Assumes $50 oil and $3 natural gas. Underpinning those numbers is the fact that much of the current development in the PRB is in shallower sandstone oil reservoirs, typically requiring less intense fracking than true shale formations. The highest-ranked company in Baird’s analysis in terms of revenue per foot is privately held Ballard Petroleum Holdings LLC, which has been in the basin since 1993. When I spoke with Alexandre Ramos-Peon, a senior analyst at Rystad Energy, a research and analytics firm, he highlighted one of Ballard’s wells for the fact that it had produced more than 1,300 barrels of oil equivalent a day (91 percent oil) in its first three months despite a relatively short lateral length of 4,000 feet and only about 1,100 pounds of sand per foot. That makes for a cheap well. It is only one well, of course. Still, David Ballard and his brother Jeffrey — president and senior vice-president of the company, respectively — say the cost of a typical well has dropped by around 25 to 40 percent over the past few years. 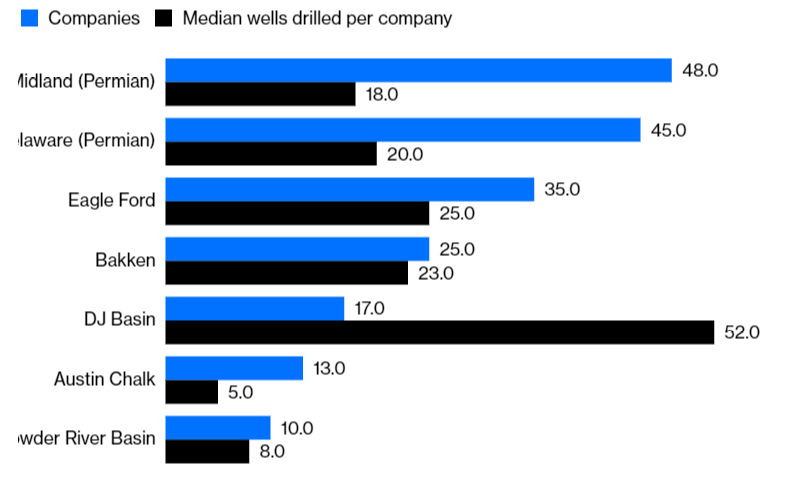 The Permian’s allure rests on it having multiple pockets of oil stacked like a layer cake stretching thousands of feet below the ground, making it target-rich for drillers. Nobody claims the PRB has that sort of potential, not least because of the paucity of data at this point. But the basin is also stacked, albeit with oil and gas split into a more-complex set of reservoirs; like a layer cake that’s been dropped and broken up. Complexity equals more-expensive wells, meaning precise drilling and smarter fracking are needed to make the economics work. Ballard says pad drilling — drilling multiple wells from a single location to save time — is established in the basin but not to the degree elsewhere, showing one obvious route to higher productivity for bigger operators with deep pockets. This should make the PRB fruitful territory for the bigger services companies pushing more sophisticated drilling and completion techniques. Apart from Halliburton, Schlumberger Ltd. and drillers Helmerich & Payne Inc. and Patterson-UTI Energy Inc. should benefit. And then there’s EOG, of course, for whom the appliance of science is something of a calling card (see this). That this company has put down a marker suggests real potential is there. Equally, though, having generated the buzz, the onus is now on EOG to show it can make that rock sing. 1. Baird's analysis looks at the first three months of production from each new well, and standardizes pricing at $50 per barrel for oil and $3 per million BTU for natural gas, and doesn't take account of royalties. This allows for a more apples-to-apples comparison between the basins but doesn't reflect real conditions in terms of current pricing, hedging and regional pricing spreads.